Our two combatants, Trevor Hills and Adam Zych, played some fast and aggressive HU poker, and it didn’t take us long to get our winner! On a 6♦ 4♦ 3♠ flop, Zych checkraised all in for his ~400,000 chip stack, and Hills made the call. Zych with J♦ 2♦ for a massive draw, and Hills with K♣ 4♣ for a pair. 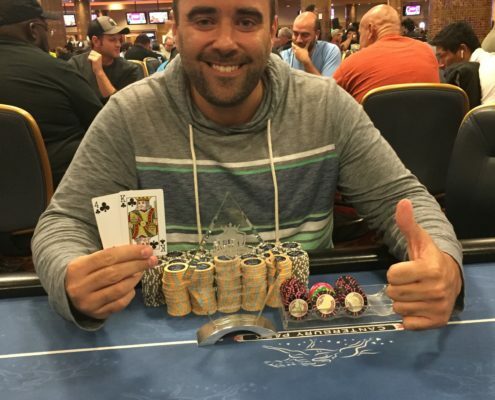 The 6♣ on the turn changed nothing, nor did the A♥ river, thus knocking Adam Zych out in 2nd place for $2,700, and securing a $3,600 1st prize plus the trophy for Trevor Hills. Today was also marked by raising $1,290 for Ronald McDonald House – Upper Midwest taken directly out of the prize pool, plus COUNTLESS others stepping to the plate and making donations of all sizes. When everything was all said and done, an additional $2,126 by the various amazing, kind, generous players who passed through the poker tournament today, ALONG with an additional $1,500 that was offered up in a match by Steve Fredlund and Our Response. And finally, another $.40 per player today donated by PIFT, so another $51.60. 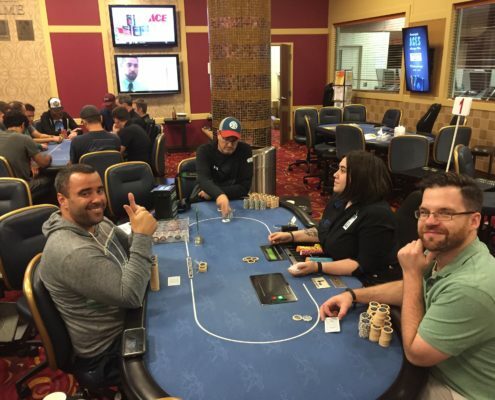 Just so incredible, words cannot express how giving Minnesota and midwest area poker players are. Adding up $1,290 + $2,126 + $1,500 + $51.60, we unofficially raised $4,967.60 for Ronald McDonald House – Upper Midwest, just today alone! So awesome!!! The response was so overwhelming that there are too many individuals to thank. Congrats to all of our winners today, and congrats to Ronald McDonald House – Upper Midwest for winning huge, too! 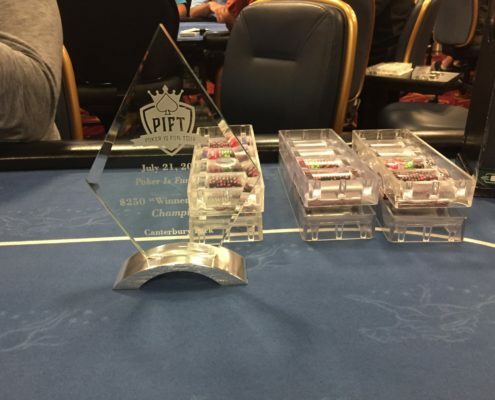 We’ll be back at it for one last PIFT tournament tomorrow, Sunday July 22 at Canterbury Park, 12:30pm: $100 NL “Crazy Pineapple,” with more live reporting! Click Here for the final results to this tournament. http://www.piftpoker.com/wp-content/uploads/2017/04/pift-logo.png 0 0 Schneids http://www.piftpoker.com/wp-content/uploads/2017/04/pift-logo.png Schneids2018-07-22 00:05:162018-07-22 14:04:34We Have Our Winner! Shortly after that last hand, Steve Shanks got all in with A3o against Trevor Hills AJo, and a blank board ended Steve’s fantastic night and weekend thus far in PIFT. He’s 2-2 at cashing this weekend, well done! Good luck tomorrow Steve if you attempt the trifecta! Trevor Hills opened to 40,000 from the button, and both Shanks and Zych called from the blinds. It was checked to Hills on the J♣ 4♦ 6♥ flop, and he bet 90,000. Shanks checkraised to 220,000, Zych got out of the way, Hills moved all in for about 283,000 total and Shanks made the call. The rest of the board ran clean for Hills, with the T♣ and 8♦ securing him a massive double up and flipping Shanks into the role of short stack for the first time in a long time tonight. On the button, Shanks opened to about 30,000, and Zych three bet to 100,000 from the small blind. Hills folded in the BB, and the action came around to Shanks. Shanks four-bet to 230,000, leaving another roughly 300,000 behind. Zych pondered and folded, leaving himself about 250,000 to work with. That hand was the first 4-bet preflop we’ve seen in awhile at the final table. Shanks ended up revealing his hand as: pocket aces! Trevor Hills on the left, Steve Shanks in the center, and Adam Zych on the right. Our three remaining players, Steve Shanks, Trevor Hills and Adam Zych, have agreed to all lock up $2,700 now, with 1st getting $3,600 plus the trophy. Congrats to our 4th place finisher today, Shide Timmons. Shide got to show several large bluffs tonight, well played! The blinds will be 6,000/12,000 with a 2,000 ante after the break. Adam Zych open raised to 22,000 from the button, and both the blinds called. A 9♠ 7♣ 6♦ flop got checked to him and he bet 40,000, to which Shide Timmons called, and Trevor Hills moved all in — having both opponents covered. Zych gave it some consideration, then moved all in. Timmons then folded his hand. The 7♠ turn kept Zych in front, as did the K♠ river. From the button, Trevor Hills opened to 22,000. Steve Shanks called in the small blind, and Adam Zych surrended his big blind. Flop: A♥ 5♥ 3♥, in which Shanks checked, Hills bet 19,000, and Shanks called. Turn: 8♦, and Shanks again checked, Hills again bet, this time for 47,000. After a few seconds, Shanks ditched his hand. Hills revealed his T♠ 9♥ that dragged the chips.